Creamy buffalo mozzarella with coriander pesto is a perfect match. You don't have to melt the cheese if you prefer not to. Preheat the grill. Cut 4 thin slices of the bread, then cut each slice in half. Place on a baking sheet and grill for 1-2 minutes on either side until golden. 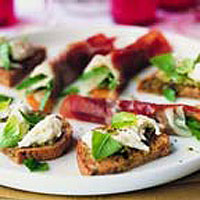 Spread each piece of toasted bread with a little pesto, top with mozzarella, drizzle with olive oil, then add some basil and season. Serve immediately or place under the hot grill again for a further 1-2 minutes, until the cheese has just melted.